Traffic barriers, which are usually used to keep vehicles within their roadway or protect temporary work areas, have become a simple, cheap and fast deployable solution for the defense against terrorist attacks such as suicide attacks and car bombs. Both concrete barriers and plastic water-filled barriers have been the symbols of heavily defended urban zones in modern local wars and anti-terrorism wars. 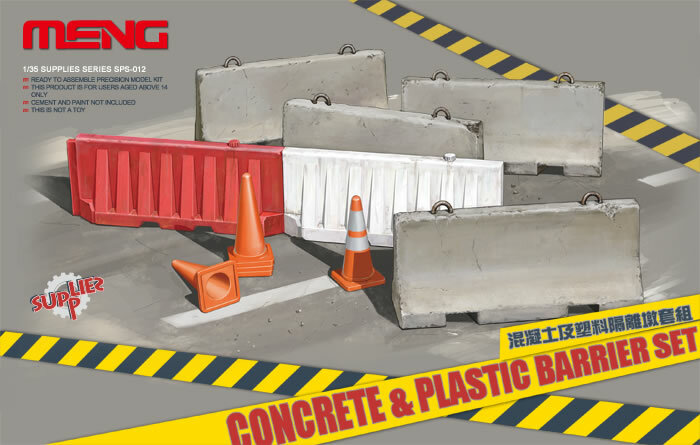 This 1/35 scale SPS-012 Concrete & Plastic Barrier Set consists of 21 parts, including 4 concrete barriers (with outworn surfaces), 1 mold (for modelers to make concrete barriers with gypsum), 2 plastic water-filled barriers, 3 cone barriers and 2 cone bases (for replicating cones stacked up). This SPS-012 kit offers an easier solution for modelers to prepare barriers. What’s more, modelers can enjoy the process of making gypsum barriers by themselves.